These Irish blessing word art graphics are perfect for traditional cut and paste crafts, greeting cards, scrap booking, and digital design projects. 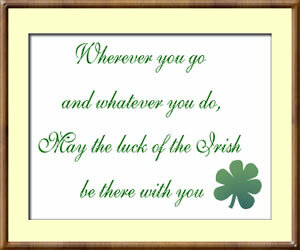 Use these Irish free word art graphics for personal non-commercial greeting cards, wedding programs, party favors or special St. Patrick's Day gifts. PROJECT TIP The mini-frame version makes a great addition to miniature displays, doll house decorations or a cheerful badge/button!